Featuring a beautiful hand-crafted wooden urn made out of beautiful Caribbean Rosewood with attention to detail in every aspect. Please notice the dovetail joints. 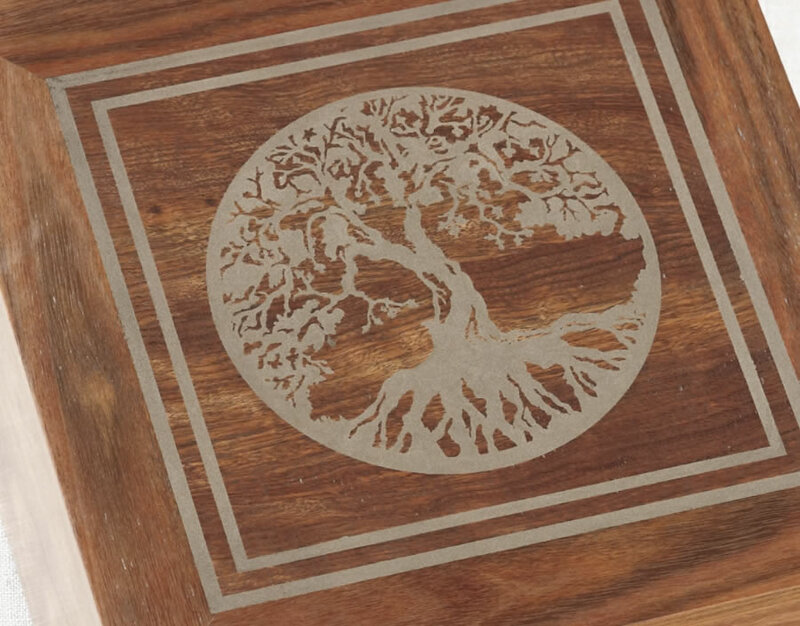 A tree of life is etched into the wood and inlaid with a silver/nickel alloy. It is then protected with a hand-rubbed wax for an exquisite finish. This is a unique and decorative art memorial that you would feel happy to show anywhere in your home. Note: These are not Cheap Chinese knock-offs. Each is professionally crafted in the U.S.
For a limited time we are offering 20 characters of inlaid metal engraving for free. This engraving is on the top of the urn. Please allow 3-4 business days for engraving. An engraving proof will be emailed for your approval prior to the urn being engraved and shipped. If you would like more engraving or want to engrave your own artwork please contact us for a quote. Custom engraving of artwork can take 2-3 weeks to complete. Available as a Square Urn with bottom opening or as a Memory Chest style urn with a lid that opens on hidden brass hinges for customers who want a top loading urn.